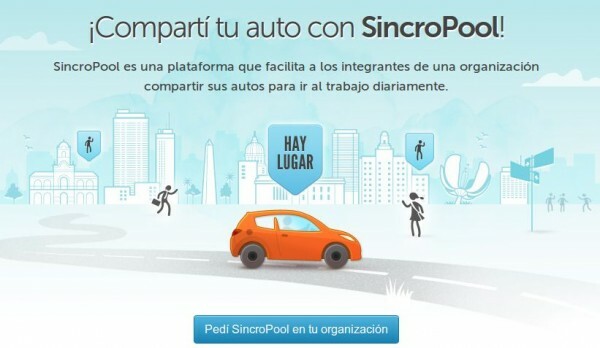 With forecast to expand to Brazil, Colombia and Ecuador, Sincropool ( sincropool.com ), which already operates in Argentina and Peru, expands the list of websites that we have available to share cars with strangers. In this model we have seen applications that allow carpool with coworkers , with Facebook friends com friends of friends, with complete strangers, with specialized agencies Sincropool … model fits with the first of these, a platform that we can adopt in our businesses so that employees can use fewer cars when traveling to and from their homes. Its customers are companies with lots of employees, companies that are located in places with high turnover, far from the centers, no public transport, dedicated to teaching (with large number of students) … companies that understand the benefits if people would who attend their centers will use fewer cars, something beneficial to the pocket of the company (reducing parking spaces, increased punctuality, etc..) and the health of our planet (which directly affects our own) . The solution, as you see, is exclusive organizations . In Brazil already have tried to implement similar systems, without much success, in some of their capital. The lack of customers is often caused by the lack of incentives to companies’ own employees using these systems, and the lack of government incentives to companies who apply. Anyway, it is clear that is part of a solution, soon cease to be optional and will become mandatory. Follow the news by twitter.com / wwwhatsnew , Facebook.com / wwwhatsnew or Google Plus .